In our homes, we are constantly reminded to keep our plumbing pipes clear. Actually, we’re reminded of that fact whenever those pipes become clogged! Typically, most homeowners don’t do a lot of maintenance on their plumbing until it is too late. Then it’s an emergency call to the plumber and a huge bill. A little preventive upkeep can go a long way towards avoiding those nasty backups. That’s why the city of Denver has been sending cameras down into the sewers. They are attempting to inspect every inch of the massive sewer system and the best way to do that is with a snaking robot camera. As it turns out, this was a good call because recently those cameras stumbled upon two exceptionally large blockages that were on the verge of jamming up sewage and dumping it out into the Sand Creek greenway. When you consider that the wastewater produced by 1.7 million metro Denver residents has reached 130 million gallons a day that flow through 3,500 miles of tunnels then you can see the need to keep those sewer lines free of debris. Truth be told, that concept of a “debris free” existence is something we should all embrace. What kind of debris do you have around your home and property? Is it time to finally get rid of it all? If the answers are “a lot” and “yes” then your next call should be to Junk King Denver. Ever since Junk King set up shop in Denver they’ve been helping residents and business owners clear out the clutter in their lives. How can they help you? Think about all those items in your home that are too bulky to throw out in the weekly garbage. Or what about all that e-waste that you know needs to be properly disposed of? Those are the kinds of junk removal projects that Junk King Denver has excelled at. Their crews will arrive at your home on the designated pickup day with a truck big enough to haul off whatever you’ve got to get rid of. Those crews will climb down the basement or go up to the attic to remove junk items. If you’ve got stuff out in the backyard like yard waste they’ll be happy to cart all of that off as well. Basically, if you want something tossed out Junk King Denver is your best friend. The way Junk King works is simple: You’ll call for an appointment with a supervisor to assess the amount of trash you want taken away. This is important because you’re going to be charged by the amount of space your trash takes up on the truck. There will be no extra dumping fees, labor costs or “heavy item” charges. It’s all direct and to the point. Once you agree on that price the removal day will be scheduled. You’ll be amazed at how quickly Junk King can carry out all that clutter. Before you know you’ll be free of debris with plenty of open space all thanks to Junk King Denver. This entry was posted in Denver Appliance Disposal, Denver Debris removal, Denver Junk Hauling, Denver Junk Removal, Denver Junk Removal Price and tagged Denver Debris removal, Denver Furniture Pickup, Denver Hot Tub Disposal, Denver Junk Hauling, Junk Removal Denver on October 29, 2012 by Paul Durant. Last updated August 1, 2017 . Are you a recyclables hoarder? Yes, that is a thing. It starts out as you having the best intentions. You want to do your part for the environment so you begin separating all of your refuse. The kitchen stuff is easy. That would be all the newspapers, cartons, magazines, soda cans, glass bottles and just about anything else that can fit into you recycling bin for a weekly pickup. The problem is when you start hanging onto stuff in the hope of recycling it… someday. It’s just that “someday” keeps getting put off. Maybe the trunk of your car starts filling up with newspapers and cardboard boxes that you collect from work but now they’ve taken up so much space you can’t even see the bottom of your trunk. These same piles of papers could be gathering dust in your garage. That’s when it gets a bit dicey because those papers could represent a fire hazard. What about all the Styrofoam you’ve managed to hang on? This could come from packing from big items like TVs or appliances. You’re right that they can’t be put in with the regular recyclables so you hang onto them. As the piles grow bigger you start feeling even guiltier. You keep collecting. Now your house is overrun with the stuff that needs to be properly disposed of but it’s clearly out of your control. Does any of this sound familiar? If it does then it might just be a sign that it’s time to call in a junk removal specialist like Junk King Denver. Junk King is made up of professional junk haulers who are licensed, bonded and insured. They’re also part of a national franchise of Junk King businesses. One of the primary goals of Junk King Denver is to divert as much trash away from area landfills as possible. It’s no different here in Denver where there are dozens of recycling centers and they’re all on the daily route of the Junk King fleet of trucks. While it is true that Junk King can help you clear out all your recyclable materials they can do so much more. Bulky items like sofas, love seats, tables, bedroom sets and appliances could also end up at a Denver recycling center being dropped off by Junk King. This will really have a positive impact on reducing your carbon footprint. It will also help you take back even more space in your home that you can put to better use. 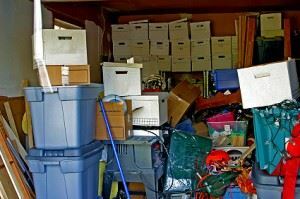 Get rid of the hoarding guilt and let Junk King Denver help you clean up today. This entry was posted in Denver Junk Hauling, Denver Junk Recycling, Denver Junk Removal, Denver Junk Removal Price, Junk King Denver and tagged Denver Appliance Disposal, Denver Hauling, Denver Mattress Disposal, Get Rid of Junk Denver on October 22, 2012 by Paul Durant. Last updated August 1, 2017 .